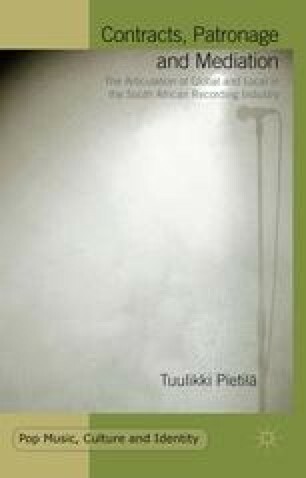 In this chapter I will argue that patronage arrangements continue today in the recording industry alongside the contractual agreements. Patronage features can be found both in the small labels and the bigger ones, including the majors. The record companies’ and labels’ representatives usually maintain that when making a contract, they always ask the artist to consult a lawyer before signing it. Not all artists are in a position to or have the financial resources to do so, however. One such reason for not consulting a lawyer came out in the previous chapter’s narratives and applies to contemporary times as well: an artist (in particular an emerging artist) is so happy to get the chance to record that he or she does not bother much with contracts and their contents. It is not uncommon either that the issue of the written contract arises only after the record has been made. The entertainment lawyer Mark Rosin explained that some of the new artists do consult him but in the case where the contract is being negotiated after the recording is done, the artist is in a weak bargaining position and often so anxious to get the record released that she or he is inclined to accept a contract with unfavourable terms and a very low royalty rate. While an incomplete understanding of the details of contracts remains a common problem among new artists regardless of the company they sign with, recording without any contract happens more easily today with small labels than with the major ones, which are under scrutiny from the overseas parent companies.